Denis is a bookseller specializing in the area of T. E. Lawrence. He can help you locate rare and out-of-print books on this and other topics. 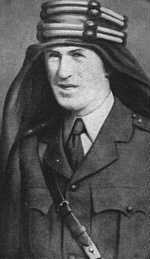 He also publishes T. E. Notes: A T. E. Lawrence Newsletter. Use the link below to visit his web site for more details. I read somewhere that, with the exception of one or two years during World War II, not a year has passed since 1922 without a book by or about T.E. Lawrence being published. For those of you reaching for a calculator, that's 73 years. There were (and still are) years in which more than one such book has been published. No matter what the final tally, it's quite a lot of paper devoted to the recording of one man's life. Several factors over those seventy-odd years have contributed to periodic surges of popularity. Each of these publications has sparked a corresponding renewed biographical interest - the ultimate result being more published books. 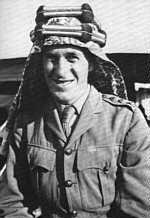 The first impetus would have been Lowell Thomas' slide lecture, The Last Crusade - With Allenby in Palestine and Lawrence in Arabia, that he performed to packed London houses such as The Royal Albert Hall in the early 1920's. Thomas eventually took it on a worldwide tour and made a fortune from it. 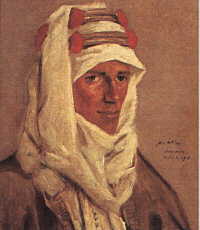 In 1924 his book, With Lawrence in Arabia,was published and was followed by The Boy's Life of Colonel Lawrence in 1927. Other biographies began to appear such as Lawrence and the Arabs (1927) by Robert Graves and 'T.E. Lawrence' in Arabia and After (1934) by Basil Liddell Hart. In 1927 Jonathan Cape & George H. Doran published Revolt in the Desert, which was an abridgment of Seven Pillars of Wisdom. TE abridged Seven Pillars of Wisdom and allowed it to be published so that the royalties would help pay for the illustrations and production of the "Subscriber's" edition of Seven Pillars of Wisdom. When he had the money he needed, he donated the rest to the RAF Benevolent Fund which cared for the families of RAF pilots who died while on duty. The sales of Revolt in the Desert astounded everyone; especially Jonathan Cape, who was able to move his small publishing house to much larger quarters and become recognized in London publishing circles. It was in no small part due to the success of Revolt in the Desert that he was able to do this. TE died as the result of a fatal motorcycle crash in 1935. It was in that year that Jonathan Cape and George H. Doran published (in the UK and US respectively) the first limited and trade editions of Seven Pillars of Wisdom. Actually, in the bibliographic sense, these were the third editions. They were preceded by two much smaller editions. The first, called the "Oxford Edition" consisted of only eight copies that TE had printed on the Oxford Times printing press. The "Oxford Edition" is obviously the scarcest of all, bringing bids of $100,000 and more at auction, when one emerges - which isn't, as you might have guessed, often. The second edition is referred to as both the "Cranwell" and "Subscriber's" edition. It was been given the description "Cranwell" because TE was at the RAF cadet school in Cranwell at the time of its publication. It has also been termed the "Subscriber's" edition because it was sold by subscription. The "Subscriber's" edition was an elaborate book whose every aspect - down to the minutest detail - was supervised by TE. He deliberately chose to use several binders, so that no two books would look alike. He did not number or identify any of them in any way so the total number of copies produced has always been a mystery. These copies, when they appear, command prices of tens of thousands of dollars. In the years following 1935 several of TE's lesser known works were published in Britain. Crusader Castles: The influence of the Crusades on European military architecture - to the end of the XIIth Century (Golden Cockerel Press, 1936), his Oxford thesis; Diary of T.E. Lawrence MCMXI (Corvinus Press, 1937), the diary he kept while on a walking tour of Syria in 1911; Two Arabic Folk Tales (Corvinus Press, 1937), two Arabic children's stories he translated in 1911; An Essay on Flecker (Corvinus Press, 1937), an article on poet and friend James Elroy Flecker; Secret Despatches from Arabia (Golden Cockerel Press, 1937), a compilation of TE's contributions to the Arab Bulletin, which was a British Intelligence circular for the Arab Bureau in Cairo during World War I; Oriental Assembly (Williams & Norgate, 1939), a compilation of his 1911 diary, the introductory chapter of Seven Pillars (which was suppressed in the 1935 as it was considered to controversial), several newspaper articles, and 129 photos taken by TE; and Men in Print (Golden Cockerel Press, 1940), a compilation of book reviews TE wrote, some under the pseudonym of "C.D." (Colin Dale). Among other books published on both sides of the Atlantic in 1937/8 were The Letters of T.E. Lawrence (1938), the first collection of TE's letters; T.E. 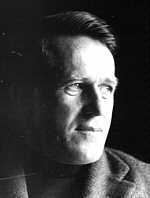 Lawrence by His Friends (1937), essays written by friends of TE's aspects of TE they felt they knew best; and T.E. Lawrence to His Biographers (1938) by Robert Graves and Basil H. Liddell Hart. The number of Lawrence-related publications in the postwar years was lean compared to the number published in the 1930's. However, in 1955 TE's The Mint: A day-book of the R.A.F. Depot between August and December 1922 with later notes by 352087 A/c Ross and Richard Aldington's Lawrence of Arabia: A Biographical Enquiry were published. Aldington's biography, which was among the first to make reference to TE's illegitimacy (his real family name was Chapman), also generally attempted to debunk the Lawrence of Arabia legend. The biography caused quite a stir among Lawrencians and, of course, much was published as a result. Some of these books were published as direct rebuttals to Aldington's book. In 1962, Columbia Pictures released David Lean's Lawrence of Arabia. The film, though historically inaccurate in many ways, won seven Academy Awards and, of course, prompted several new biographies of Lawrence for adults and children. It also, believe it or not, caused the publication of several comic books with "Lawrence of Arabia" themes. Seven years later, part of the embargo on official British secret documents concerning TE's activities in the Middle East was lifted. Arnold Lawrence (TE's youngest brother) then allowed two London Sunday Times reporters access to the TE document collection at the Bodleian Library in Oxford. The result was The Secret Lives of Lawrence of Arabia (1969), which was the most immediate consequence of this abundance of fresh biographical material. The 70's brought the publication of John Mack's A Prince of Our Disorder (1976). Mack, then Head of the Department of Psychiatry at Harvard Medical School, brought to his biography the psychological aspects of TE's personality in a very readable fashion. Winning for him the Pulitzer Prize in biography, the book is still regarded by many as the best all-round biography on Lawrence. Harford Montgomery Hyde's Solitary in the Ranks: Lawrence of Arabia as Airman and Private Soldier (1977) dealt with TE's post-war years, i.e. 1922 to 1935 - a hitherto neglected, but immensely interesting, period during which TE retired from public life and enlisted in the RAF. Among his many achievements during that period, he translated The Odyssey of Homer (1932) for Bruce Rogers. For Jonathan Cape he translated the French author Adrien LeCorbeau's Le Gigantesque (The Forest Giant).(1924). He wrote The Mint, a then extremely controversial look at the barracks life in his early days in the RAF. Lawrence also developed and nurtured friendships with the likes of John Buchan, Winston Churchill, F.N. Doubleday, E.M. Forster, David and Edward Garnett, Robert Graves, Thomas Hardy, Frederic Manning, Siegfried Sassoon, George Bernard and Charlotte Shaw, Henry Williamson, and many other literary and political figures of the day. This decade, i.e. the 70's, also marked the beginning of scholarly study of TE, with several doctoral dissertations being published in the US and abroad (most notably in France and Germany). Lawrencian publications in the 80's were given a lift by the centennial of TE's birth in 1988. Among the many works published that year, the most prominent was the definitive bibliography, T.E. Lawrence: A Bibliography (1988). Compiled by Philip O'Brien, the Director of Wardman Library at Whittier College, this 724-page work is considered the bibliographic "bible" for any Lawrencian collector. Phil is currently in the final stages of compiling a supplement. The re-release of the film Lawrence of Arabia, with several restored scenes, attracted immense interest. Jeremy Wilson's Lawrence of Arabia: The Authorised Biography (1989) was chosen by the New York Times Book Review as one of the fourteen "Best Books of 1990". The 90's have produced several biographies and a TV movie by David Puttnam. A Dangerous Man starred the now much sought after actor Ralph Fiennes. Even George Lucas' The Young Indiana Jones Chronicles had TE appearing in a few cameo roles. When and where will it all end? It's doubtful that it ever will. The British government still has documentation that isn't due to be released to public scrutiny till the year 2000. Several collections of TE's letters and documents are still privately held. At this very moment, a man named Clifford Irwin is compiling a bibliographic database of TE's letters - their recipients, general content, whereabouts, etc. It is estimated that in excess of 10,000 letters are in existence, most of which have never been published.